The debate over violent acts in hockey will rage on. We need to debate violence in the sport in order to perpetuate change. I see this debate as surrounding three types of incidents. The first is what happens in the heat of the moment: The adrenalin-driven acts that happen in a split second. These types of things may not have occurred had the perpetrator taken an extra breath and had a clearer thought. However, as professional athletes, they are trained to strive to keep such emotions in check and to react from their brain not their gut. The knee to head contact from James Neal to Brad Marchand falls into the category of being in the heat of the moment but letting emotion rather than intellect dictate your actions. This type of contact will never be separated from hockey. Any sport where there is legal physical contact will always have gut reaction types of hits. Punish them and move on. 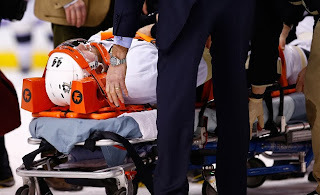 The second type of violent act in hockey are those which fall within the rules of the game but someone gets hurt none the less. When you combine high speeds with defensive acts, injuries are inevitable. The hit Brooks Orpik leveled on Loui Eriksson was within the rules of hockey. 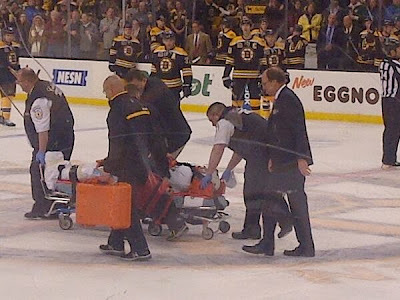 Eriksson was concussed when he hit the ice as a result of the hit. Clean hit, bad outcome. This type of contact will never be separated from the game. The rules of the game dictate what is a legal hit and what is a dirty hit. Again, when you combine speed with defensive actions, an injury may result from the aftermath. The third type of violent act occurs when one player acts out of rage against another player for a reason usually only known to him. These are the acts that can be separated from the game. It isn’t a fight if both parties don’t agree to the contact or if the second player doesn’t make defensive moves. A prime example was Ray Emery’s attack on Braden Holtby. From the moment Emery made the aggressive move toward Holtby, it was clear Holtby wasn’t interested in fighting Emery. In an interview, Emery even stated that Holtby said he didn’t want to fight yet Emery commenced to wailing on him. A worse example is the Trevor Gillies attack on Eric Tangradi back on 2/11/11. Last night, Brooks Orpik’s jersey was in the grip of the referee and Orpik was engaged with the referee concerning an altercation. Shawn Thornton skated to Orpik, grabbed him and threw him to the ice. Before the ref, who was right there could even act, Thornton was hitting Orpik who was likely unconscious from his head hitting the ice. I’ve read comments that said, “Orpik should have fought him.” That swift blind-side attack was indefensible. 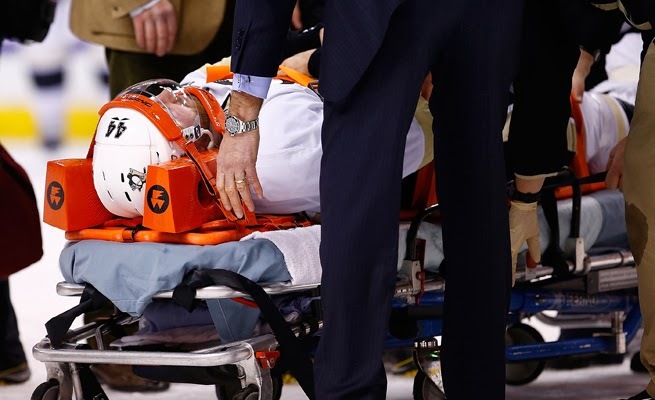 Orpik was stretchered off the ice and transported to Mass General. These are the types of contact that can and should be removed from hockey. Hockey is a great sport. It’s fast-paced, skilled and physical. Blind side attacks are barbaric and dangerous. Such attacks don’t occur often but when they do, it’s up to the Department of Player Safety to take serious and decisive action: make no exceptions, be consistent and punish to the extent that players will be deterred from such barbaric actions.